I have always been a big believer in the power of understanding. When you really ​get​ something, that knowledge empowers you. Lots of people talk about the lead leg. The question is, do you really understand exactly what is being talked about and - most crucially - why and how it matters to you as an agility handler? Because it definitely does matter, to you and your dog. When I first learned agility I was taught all sorts of moves - front crosses, rear crosses and so on - but I never really knew why I was doing them or exactly where and how I should choose to do them, until I understood about lead legs. This knowledge has influenced everything from whether I lead out with a cross or not to how I deal with discrimination challenges and how I can achieve better course times. 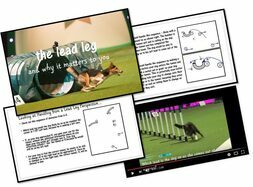 When I first came across the concept of the lead leg through various trainers, it took quite a lot of research and a lot of watching my dogs and others doing agility before the significance and the far-reaching consequences of lead legs really clicked with me.